I picked up Meet Me at the Cupcake Cafe for two reasons. First, it looked adorable and easy to read. Second, it included recipes for cake. What possible reason could I have for turning down cake (apart from diet, but I'd rather not be reminded of that)? Besides, it was a cheap charity shop purchase, there wasn't much for me to lose. 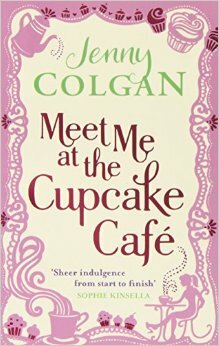 Meet Me at the Cupcake Cafe follows Issy Randall, an admin clerk at an estate agents who is just sort of bumbling through her life. That all changes when she loses both her job and her boyfriend in one fell swoop. After a few weeks of moping around, she finds herself looking around a shop for rent more or less on a whim, and decides to set up a bakery/cafe. She soon finds that this venture may be a lot more complicated than she ever thought that it could be. I was expecting this to be harmless and fluffy, and I got exactly what I expected. There's some romance and some angsty moments that come with it. There's the whole plucky lady underdog story which is nice, especially with some of the detail provided about actually running a business. The characters are pretty vivid, if a little on the simple side. Really, this is kind of a difficult book for me to review, because it is pretty much exactly as I thought it would be and I honestly don't know how to expand on that. Usually my thought process will compare and contrast my expectations with the actual results, picking out things that stood out to me, good or bad, as a result. Here, Meet Me at the Cupcake Cafe not only matched the blurb better than I've ever seen in a blurb before, but it fit the sort of cute and charmingly vintage but spunky feel that chick lit books seem to be best known for. It's that everywoman thing that many of them aim for, the woman who isn't stick thin and hates it in themselves while loving it in all of their equally curvy or chubby friends, the woman dissatisfied with her life but too nice to make a fuss until everything piles up too much. Someone relatable, or at least someone intended to be relatable. It's the sort of thing that, if I turned my brain to it and really focused on it, I could find incredibly artificial and weird, and I think part of me objectively knows that there are particular elements that will always find their way into chick lit because they're deemed relatable and will therefore sell. But honestly, when I pick up chick lit, it's because I'm drained from whatever I was reading before. So really, if you're looking for something cute and non-threatening, then you can certainly do a lot worse than this.